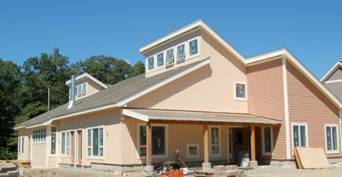 The Common House at Camelot Cohousing is the center of our neighborhood, both physically and socially. It's the place where the community comes together -- for shared meals, for games and entertainment, for meetings, for parties, for hobbies and activities. Spectacular Great Room for optional shared meals and large events. Features soaring clerestory ceiling, two-sided tiled fireplace, bamboo floor. Four additional rooms for hobbies, meetings, sewing & crafts, games, etc. All residents have full use of the common house. It's like having a luxury recreational facility next door to enjoy with neighbors and friends.